I know today is Election Day 2013, but for better or worse much of the attention lately has been about the 2014 elections. Filing season begins later this week, and we now have a new poll result suggesting that the Governor’s race starts out as a close one. Attorney General Greg Abbott, the leading candidate for the Republican nomination for Texas governor, holds a single-digit lead over the likely Democratic nominee, state Sen. Wendy Davis of Fort Worth, according to the latest University of Texas/Texas Tribune Poll. 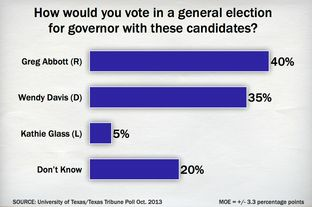 In a head-to-head race, Abbott got 40 percent of registered voters to Davis’ 34 percent, with 25 percent of the voters undecided. In a three-way general election, he would get 40 percent, Davis would get 35 percent and Libertarian Kathie Glass would get 5 percent. “What you’ve got is a race in which, for the first time in a long time, the Democrat is as well-known as the Republican at the outset of the race,” said poll co-director Daron Shaw, a professor of government at the University of Texas at Austin. Davis holds a lead over [Tom] Pauken in a potential head-to-head race, according to the survey, getting 38 percent to his 34 percent, with 28 percent undecided. When Glass was added to that mix, Davis got 36 percent, Pauken 33 percent and Glass 6 percent, with 25 percent undecided. The poll methodology is here and the summary is here. I believe this is the first venture by UT and the Trib into the Governor’s race. Public Policy Polling will be doing Texas this week, so we’ll have another result to compare this to. PPP had done earlier polls involving both Abbott and Rick Perry against a variety of potential candidates; PPP had Abbott over Davis 48-40 in July, shortly after the famous filibuster, and Abbott over Davis 46-34 in January. We’ll see what they have this time. A couple of things are clear. One is that unlike previous elections, this one starts out with two candidates that are about as well known as the other. One wonders when Abbott will start dipping into his gazillions of dollars to start blanketing the airwaves with positive messages about himself and negative ones about Davis. For her part, Davis can jump in anytime and start running issue ads herself. She probably doesn’t need as much of an introduction as Abbott does, which is more than a little weird when you think about it. The situation overall is pretty fluid, with Abbott having a few points’ partisan advantage, but not enough of one to feel comfortable. Obviously, this is a decent result for a lot of reasons, but let me play the wet blanket here for a minute and stomp down on some excessive exuberance. Do you wanna know when was the last time a Democrat in Texas started within single digits? I don’t know either so it had to be while the earth was cooling. Actually, the last time a Democrat in Texas was within single digits in the Governor’s race was 2010. PPP had Bill White tied with Rick Perry in June 2010, and trailing 48-42 in February. Rasmussen had Perry over White 49-43 in March, right after the primary, and up 50-40 in January, which was the first poll for that race. Yes, that was a two-digit lead, but still. For many reasons, I don’t believe 2014 will be like 2010, I just want to point out that we have seen encouraging poll results before. Let’s not believe we’ve won anything just yet. Again, this is a decent result, but it’s just one result and it’s early. We’ll need to keep an eye on the trend, and see if Davis can make gains. In particular, we need to see if she can get past 42 or 43 percent, regardless of what that makes the difference between her and Abbott. I don’t think I’ve seen any Dem top 44% in a poll in the last decade. That will be the test. There were other races polled as well, mostly Republican primary races. Davis is the only Democrat in the race right now, but Abbott faces a five-candidate Republican primary. According to the poll, he would win that primary race handily: Half of the Republicans polled said they would vote for Abbott. His opponents — Lisa Fritsch, Tom Pauken, Miriam Martinez and Larry Kilgore — combined for only 8 percent, while 42 percent said they haven’t decided how they would vote in the GOP primary. I didn’t think much of this, but via PDiddie, I see that Harvey Kronberg did think it was. The stunner in today’s Texas Tribune poll was not that Wendy Davis is within shouting distance of Greg Abbott in a general election, but that with all his money and name ID among Republican primary voters, he just hits 50%. One wobble and he could be in an unpredictable and volatile runoff where anything could happen. Honestly, I wouldn’t read that much into it. It’s known Abbott isn’t universally known even among Republicans. But look, he’s at 50%, and his opponents don’t even add up to five. I don’t see him as being in any danger of a runoff, unlike David Dewhurst or Big John Cornyn, who couldn’t crack 40% even without the wingnut David Barton in the race. Cornyn’s been busy campaigning already; I wouldn’t let up if I were him. BOR, Texpatriate, Texas Leftist, and Burka have more.